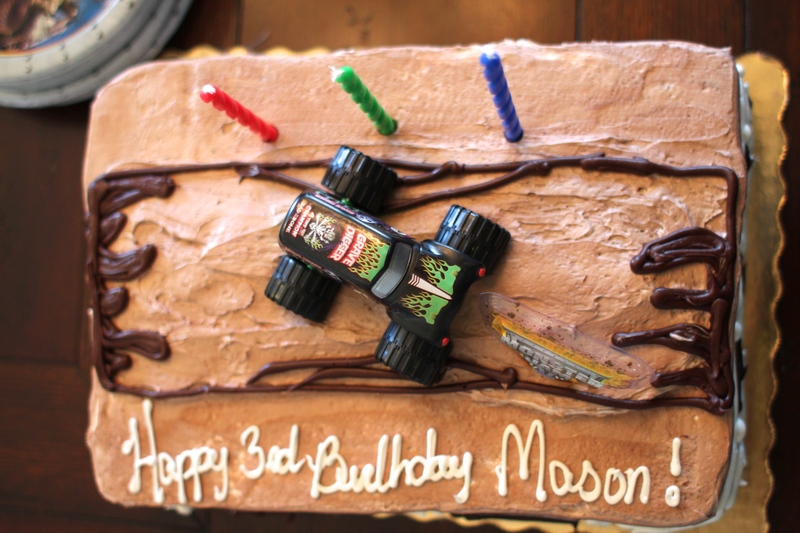 For as long as I can remember, Mason has been obsessed with Monster trucks! It started when he saw Mater’s Tall Tales and he really loved the Monster Truck scene on the movie. 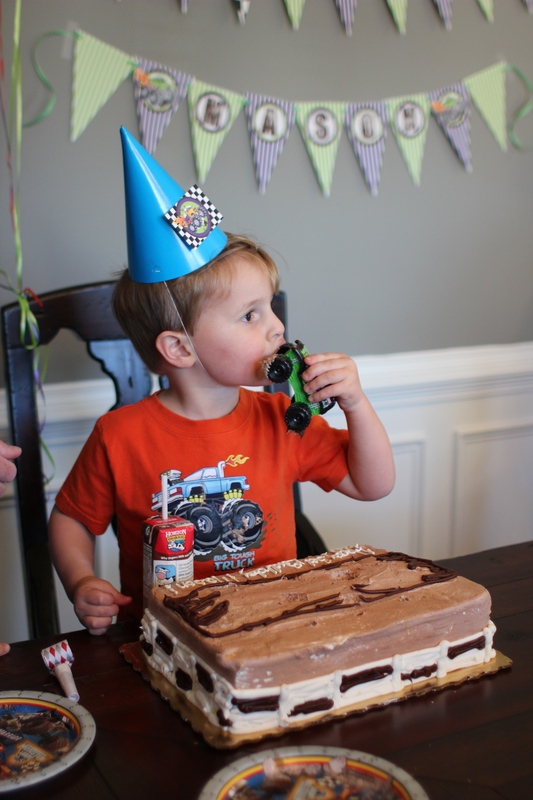 It really solidified the obsession when we took him to see Monster Jam live at Phillips Arena in January. He just couldn’t get enough of the trucks, big tires, and the free style moves they did! 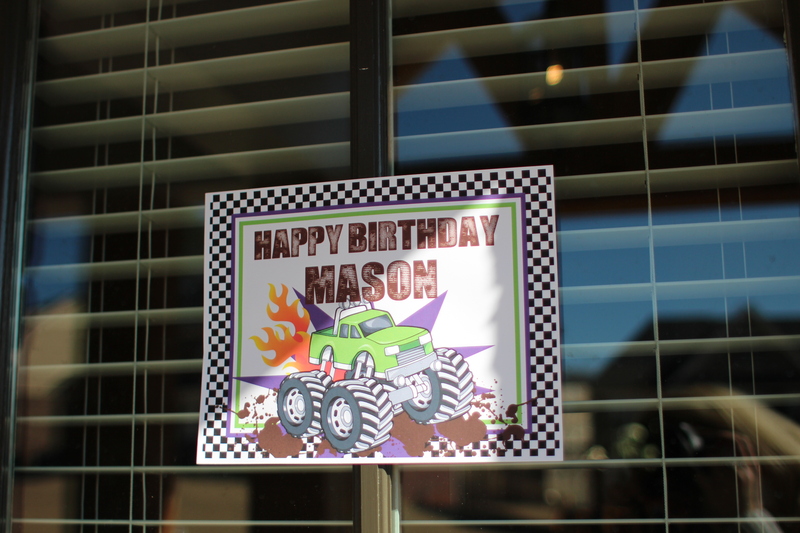 So, naturally we wanted to do a Monster truck theme for his party. I found a few print files on Etsy for purchase and printed a monster truck themed banner at home, and cut and assembled it myself. This is one of the reasons why I wanted so badly to get a color printer for Christmas. 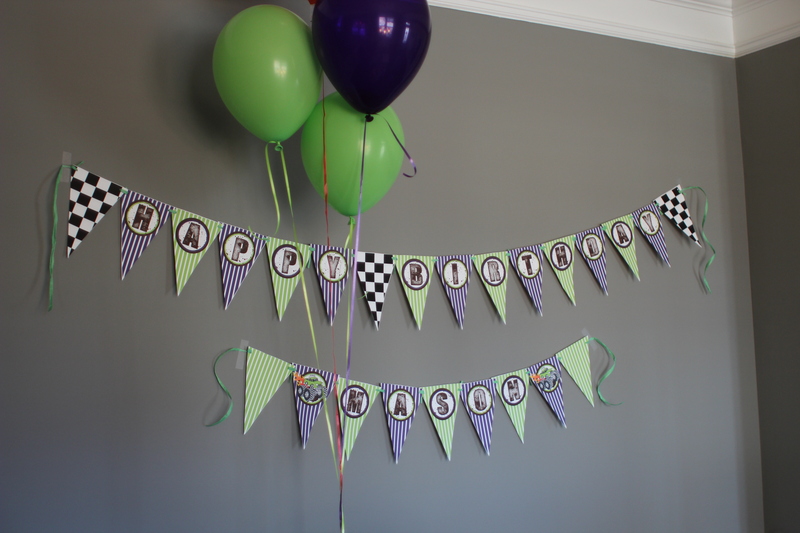 It comes in handy for fun party planning things such as this! I think it turned out great, and it also came with little monster truck add-ons for the birthday hat, and signs to add to the mailbox and door. Such cute graphics! 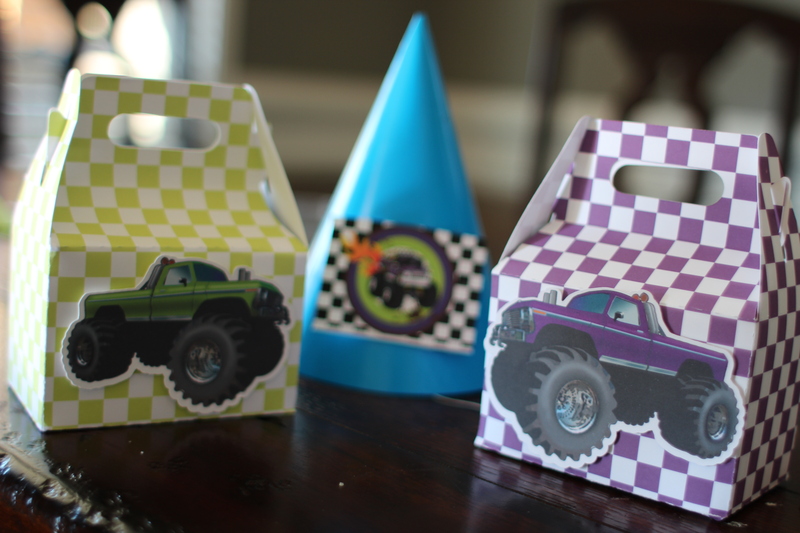 The party favor gable boxes I got from the same place I got Parker’s super hero boxes for his party, since I was so pleased with them. 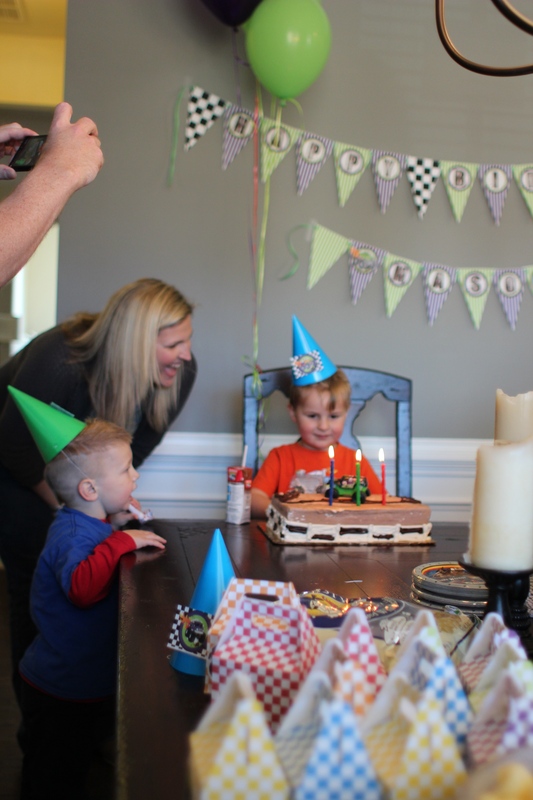 Since Mason can get a bit overwhelmed in large groups, especially those where he doesn’t know very many people, we decided to stick to only familiar faces, and little friends he sees regularly at school, church or playdates. The party went well, but there were still moments when he got a little overwhelmed, but that’s okay. We recognized it, and then moved on and enjoyed the party. 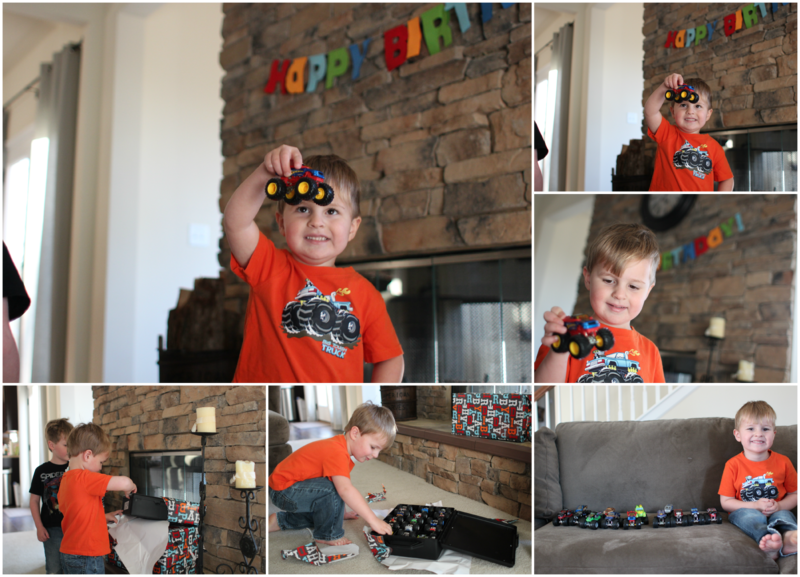 Before the party festivities started, he was allowed to open one present. We did two presents this year, one from Daddy, and one from Mommy. He opened the one from Daddy first. Dan found a great deal on Ebay for a whole set of 15 monster trucks. They were used, but in good condition, and Mason didn’t seem to mind one bit. He was so incredibly excited! He even brought them outside and put them on the driveway for his little friends to play with when they arrived. We decided to go with something different for the entertainment this birthday. We have done the bounce house before with Parker’s birthday, and got burned a little because it happened to rain the entire day, pretty much putting a damper on the party entertainment. Also, Mason has gotten hurt a few times in those things and it has turned ugly pretty quickly, and I wanted to avoid that, since it was after all a party for him celebrating HIS BIRTHDAY. Dan had suggested going with the Fun Bus. We had seen it before at the Touch a Truck events that were around town, and it was basically a bus that has been refurbished to house gym mats and equipment for an inside gym. It was perfect to keep with the four-wheels-themed party, and to also give me peace about being able to still use it in inclement weather. So, it was a win-win! 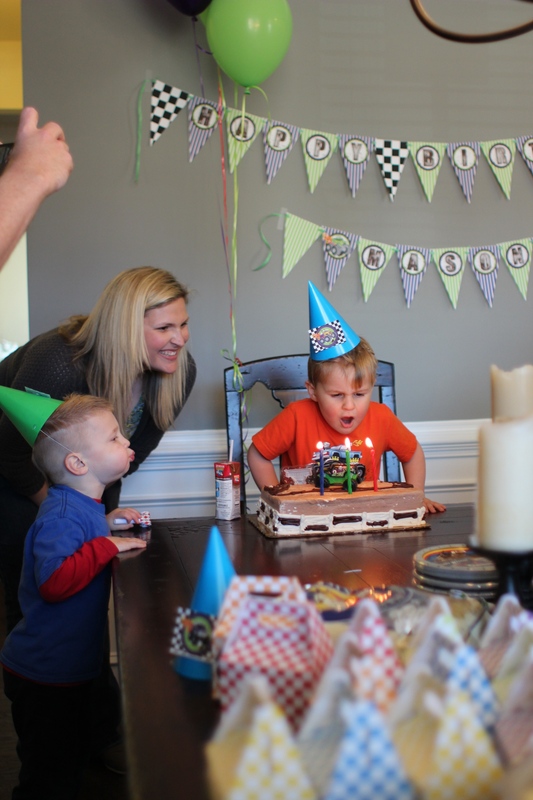 Mason was nervous at first, but once he saw how much fun it was, he jumped right in and had fun with his friends! 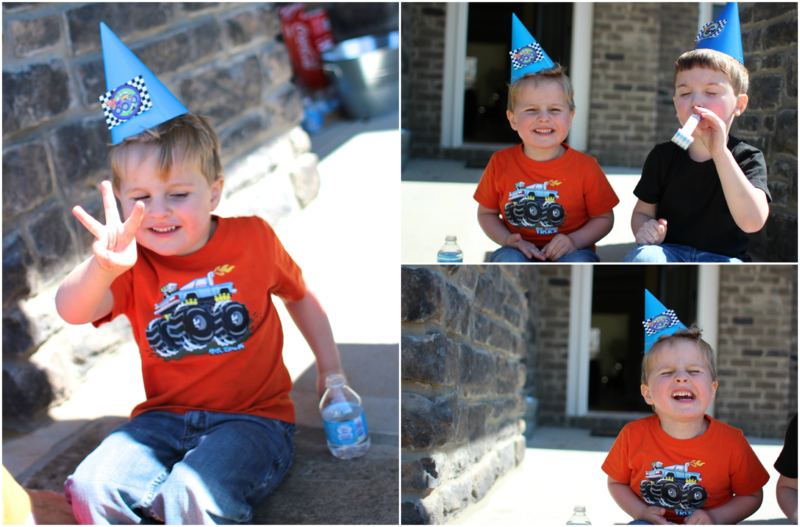 Mason had a wonderful time with his friends, and we couldn’t have asked for a more gorgeous day! 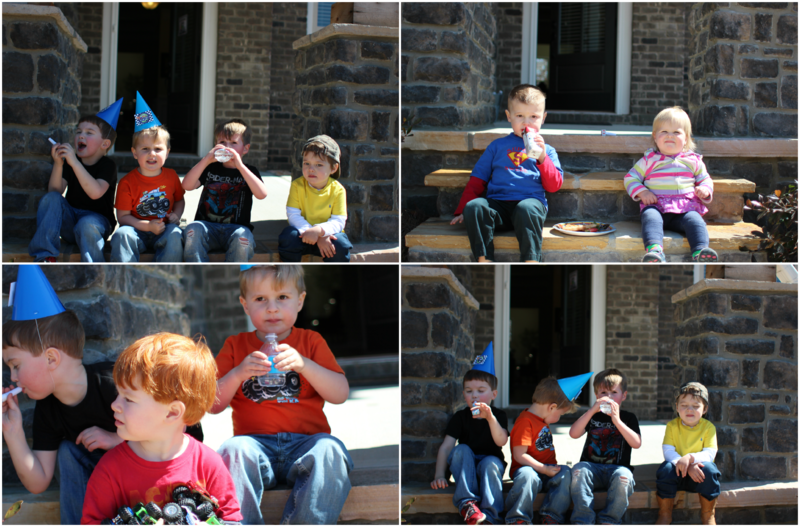 The weather was just perfect and we were happy to share this fun time with all of Mason’s little friends. My Grandad isn’t doing very well, so Nanny and Mason’s Godparents and Aunt/Uncle couldn’t make it, but we are so thankful for great friendships that help us celebrate our sweet Mae Mae! Next was cake time! 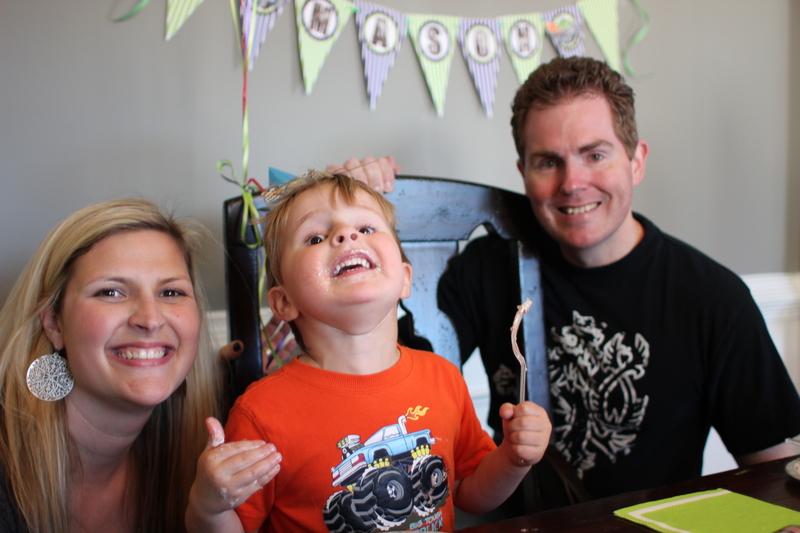 Mason enjoyed every bit of attention… and his beloved Grave Digger cake! I decided to give Publix the duty of cake making this time, and just had them hold the food coloring. Not only is it not good for you, but I really think it alters the taste of the cake, too. A big thanks to Sarah and Lauren for helping out with a few of these shots! 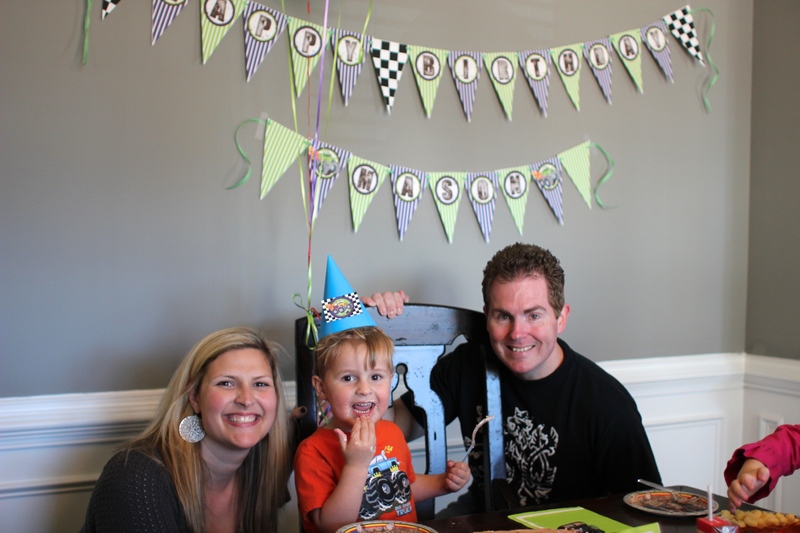 It was overall a great party and we’re glad that Mason enjoyed it. We appreciate the friends who came, and made him feel extra special that day! Mason is fully day potty trained and wears underwear but we are still working on night time. He’s enjoys figuring out things on his own and tries to undress himself when he needs to, but still needs help with socks, buttons and shirts. Mason has strong emotions and can turn them on super fast without notice. Suddenly, if something upsets him, he can go from laughing and playing one minute to upset and crying the next. He can also very quickly go from very upset and crying to laughing and cooperative. Mason’s best buddy is definitely his brother, Parker. They role play a lot, and they love to pretend to be everything from super heroes, to bad guys, to pirates. I’m so glad they have each other. Mason seems to be a bit of a Mama’s boy and still prefers me to tuck him in, read to him, and comfort him when he gets hurt. He’s also been known to get upset when I drop him at preschool or is in a situation where there are a lot of people or he feels overwhelmed. Mason loves story time. He has a few monster truck books that he loves, “Axel”, along with “Digger and Tom”, “Good Night, Good Night Construction Site” and any books that have counting and peek-a-boo flaps. Mason is still a great eater. He’s narrowed down some of his dinner preferences, but even if it’s not his favorite meal, he knows he won’t get anything else, so he usually still eats it, just not as much. Most favorite meals: Spaghetti, quesadilla , “chicken on the bone” as he likes to call it, and pizza. He likes corn on the cob, avocado, green beans and broccoli in the way of veggies. Least Favorite Meals: Meatloaf and Shepherd’s Pie (he has issues with ground beef unless it’s in spaghetti). I’ve loved watching Mason grow these last three years. I know he will continue to grow and change and I just love that I get to see little glimpses of who he will become when he’s older now. He’s very smart, caring and enthusiastic and I know those traits will evolve and grow into something even more amazing as the years go on. I’m just thankful that we get to share in this journey with him. Happy Birthday, Mason! Mason’s party was so fun and super cute! Thanks for the invitation to celebrate with you guys! Lots of happy monster truckers! Great photos! !